Item Name B L Suitable for Nut SPANNER E16 50 160 UM/ER16.. Item Name B L Suitable for Nut SPANNER E20 55 180 UM/ER20.. Item Name B L Suitable for Nut SPANNER E25 65 210 UM/ER25.. Item Name B L Suitable for Nut SPANNER E25A 65 210 UM/ER25.. 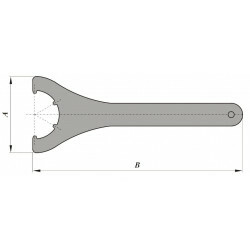 Item Name B L Suitable for Nut SPANNER E32 75 250 UM/ER32.. Item Name B L Suitable for Nut SPANNER E32A 75 250 UM/ER32.. Item Name B L Suitable for Nut SPANNER E40 90 290 UM/ER40.. Item Name B L Suitable for Nut SPANNER E50 110 350 UM/ER50..
What is Spanner Type E? Where can I buy Spanner Type E Online?